We’re incredibly excited to share that Segment’s customer data platform is now powering the analytics stack for over 3,000 mobile apps, including our friends at HomeAway, HotelTonight, Instacart, VSCO and DraftKings. Collectively, these apps have over 500 million downloads, and we’ve been poring over our data and conversations with these customers to build you something new: the Native Mobile Spec. We want to make it easy for you to collect and analyze each of these touch points. That’s why we’ve released the Native Mobile Spec, a standard blueprint for automatically tracking key events across the mobile user lifecycle. Our core product has always stripped away redundant analytics tracking with a single library for capturing user events. The Native Mobile Spec will save you even more engineering time, since you no longer have to code in essential user events one by one. To view the full details, see our documentation. If you’re an existing Segment mobile customer, you can opt-in to receive these events. The Native Mobile Spec will also slim down the size of your app because you can move key integrations, like Facebook App Events, to the server-side instead of bundling them in the Segment SDK. This functionality is available for customers that opt-in to automatic event collection and for those who instrument their own events that respect the Native Mobile Spec. Our new server-side Facebook App Events integration powers popular features like Facebook App Analytics, dynamic product ads, custom audience creation, and conversion tracking with events captured by the Native Mobile Spec. That’s saving you 1,160 KB on iOS and 4,000 methods on Android by moving the integration to the server-side! Soon, we’ll be rolling out similar functionality with server-side integrations updates for Google Adwords, covering Conversion Tracking, as well as Salesforce Marketing Cloud’s Predictive Intelligence feature to better tailor your messages. With the new SDK update, you’ll be able to get your marketing and product teams up and running with our integration partners even faster. Now that Segment automatically collects key lifecycle events, you can start measuring top mobile metrics without any tracking code. You can report on these essential metrics in your favorite analytics tools like Mixpanel, Localytics, and Amplitude, or easily create dashboards in your BI tools like Tableau, Looker, and Mode with the data collected from the Segment SDK. Nearly 22% of all apps downloaded are used only once, but the cost of acquisition is close to $5 a pop! That’s why it’s imperative to measure which of your acquisition campaigns drive the most valuable users, and to bring users back with the right mix of push, email, and SMS. 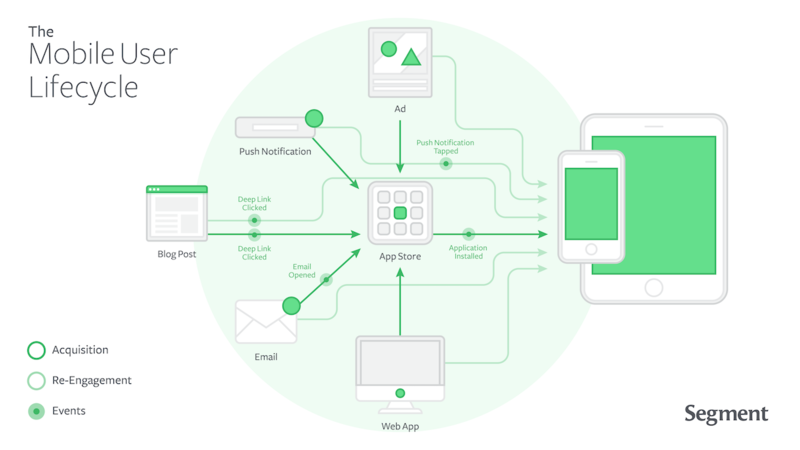 To help you measure these campaigns, the Native Mobile Spec also details deep linking, push notification, and attribution events. (Our Twilio source covers SMS!). In the next few weeks we’ll be releasing updates to our mobile SDK and mobile marketing integrations to automatically collect these events and fan them out to your analytics tools and warehouses for the first time. You’ll be able to understand the complete lifecycle of your mobile users and accurately measure the impact of your campaigns by combining your marketing events, in-app behavior, and revenue into one dataset powered by Segment. We’re excited to continually improve the Segment platform, helping you collect, combine and access data across all of your customer touch points. The Native Mobile Spec is just the beginning! Stay tuned for a wave of updates designed specifically to address the needs of mobile app companies. Not a Segment customer yet? Request a demo or sign up today!